I am a plastic surgeon in Little Rock, AR. I used to "suture for a living", I continue "to live to sew". These days most of my sewing is piecing quilts. I love the patterns and interplay of the fabric color. I would like to explore writing about medical/surgical topics as well as sewing/quilting topics. I will do my best to make sure both are represented accurately as I share with both colleagues and the general public. See bottom of page for full disclaimer. This site is self-maintained. Took a short break from the sweater knitting (see last week's post) to knit three quick hats. 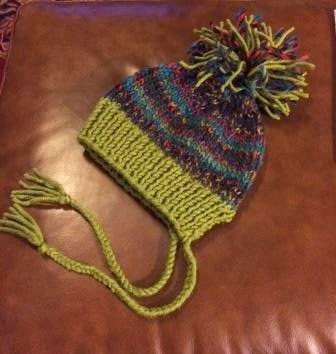 This first one is made using the pattern Split-Brim Toddler Hat by Stranded Knitter. The avocado green yarn is Lion Brand Woolspun. The second yarn is Patons North America ColorWul. 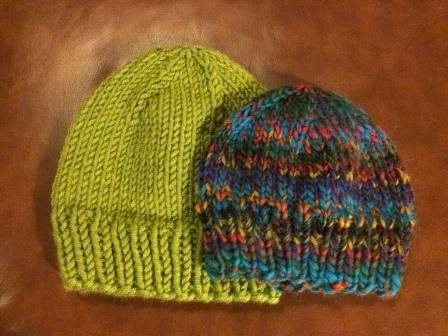 With the leftover yarn I knit these two basic hats. This first project is a sweater I was knitting (no longer in progress). I almost had it finished when I frogged it. At the point this first photo was taken I was pleased with the project as the fit seemed good. 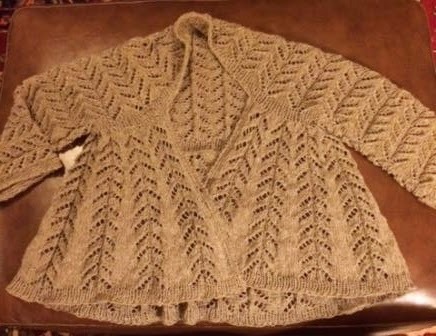 The pattern is Gemini by Jane Richmond. The yarn is Rowan Creative Linen. After finishing the body and the first sleeve I changed my mind. The fit no longer seemed good. The sweater body felt too boxy. The sleeve was way too wide. I decided to frog the project and use the yarn with a different pattern. I think I will use this one -- #14 Leaf Yoke Top by Angela Hahn. This quilt project is progressing better. 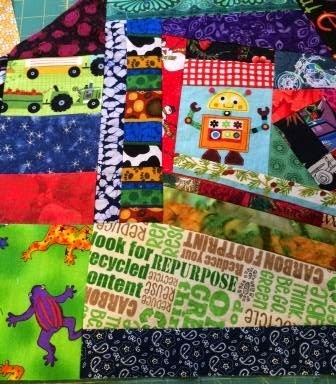 It's another of my crazy quilts for a baby or toddler. 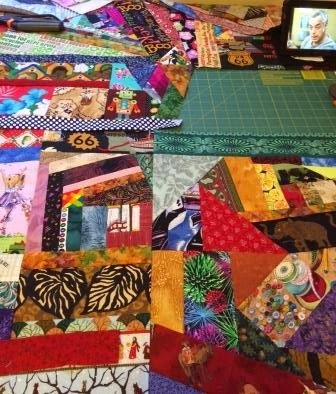 Here are two photos showing parts of the quilt top being pieced. Lots of color and objects to be found. This section has a tractor pulling a wagon full of apples, a robot, frogs, and a motorcycle. 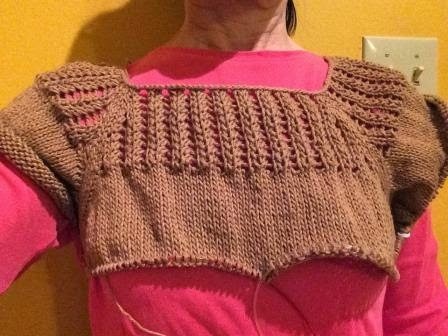 This cardigan is sort of a shrug with a body attached. 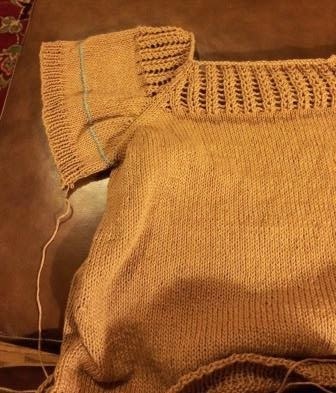 It is an easier knit than it appears. 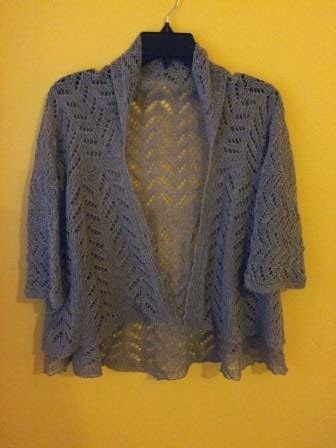 The pattern is Hitofude Cardigan by Hiroko Fukatsu. The yarn is Lotus (Trendsetter) Tibetan Cloud . 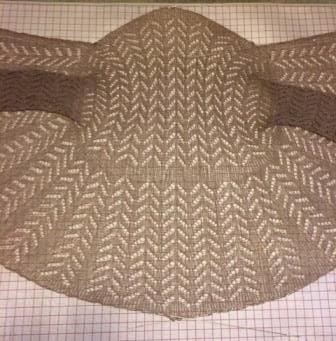 The first photo is pre-blocking. Here is the cardigan being blocked. The lace effect is really appreciated in this photo. This is post-blocking. It will be a nice sweater for cool weather like spring or early fall. This blooming nine-patch quilt top is made with four different batik fabrics. It’s a king size top measuring 114.5 in square. I recently finished the quilt top and mailed it off to be machine quilted. When it comes back I will bind it using the brown fabric. The backing is the orange fabric. My purpose in writing my blog is to attempt to provide good solid medical information on topics of my choosing. It is a way to educate myself, my colleagues, and the general public. References will be provided on medical posts, but not on opinion essays or poetry posts. 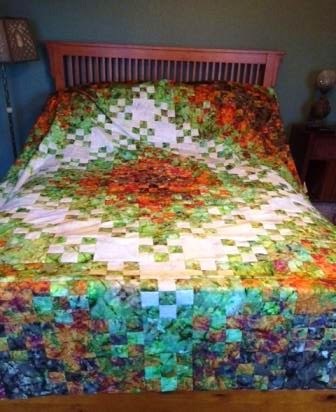 An additional purpose is to share my interest in quilting topics, a way to show my human side. Any medical information provided by this site is not a replacement for medical diagnosis, treatment, or professional medical advice. It should not be used to treat or diagnose any medical condition. Always seek professional medical consultation by a licensed physician for diagnosis and treatment of any and all medical conditions - please, do not ignore your doctor's medical advice based on information written by the author or commenters of this site. Please do not ask me for medical advice, but instead contact a healthcare provider in your area. Anything written about office/hospital situations/events are fictional examples to get a point across. No patient is/will ever be a specific patient (unless given written permission), but a fictional one. To know more about how I handle medical information about patients please link here. Unless, I am praising a colleague, even those will be fictional. Any similarities to you or people you know is purely coincidental. My husband and I, and our dogs are fair game. In early 2009 I joined the Better Health Network. As part of that Network, I will occasionally be paid for my writing. Those posts will be clearly noted. I will strive to maintain my high ethical standards. If I add any advertising, it will be clearly marked as such. I do not intend to use this blog to collect or dispense private health information on patients. If any patient is used as an explicit example for a posting, I will get that patient's consent in writing to use their story and/or photo. The office is permitted by federal privacy laws to make uses and disclosures of your health information for purposes of treatment, payment, and health care operations. However, that is not the intent of this blog. I intend to share information on medical/quilting topics with the general public and my colleagues. This web site does not share or sell any personal information, including your name, address, or email addresses with third parties. Have a blessed day!